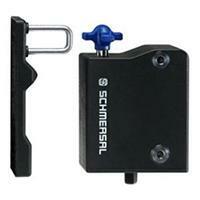 Solenoid interlocks, operating in combination with control elements of a machine, e.g. fail-safe standstill monitors or fail-safe delay timers, ensure that sliding, hinged and removable guarding devices, such as grids, hoods or doors, cannot be opened until hazardous conditions (e.g. running-down movements) have come to an end. Control Components offers the entire line of Euchner, Schmersal, ABB Jokab, and IDEC Solenoid interlock safety switches.